Description: Herbs, up to 1 m, heart-shaped leaves, and large edible corm. Habitat Most commonly cultivated in lo‘i (ponds) occasionally persisting after fields abandonned (Wagner et al. 1990:1356–1357). Medicines: There are numerous varieties of kalo, some if which are favored over others in medicinal treatments. These include kalo lauloa, kalo ‘api‘i, kalo mana, kalo hāpu‘u ke‘oke‘o, kalo uahiapele, kalo manini,kalo ‘apuwaike‘oke‘o, kalo haokea mana, and kalo pi‘iali‘i (Chun 1994:134). Abbott notes that the cut end of a petiole used to stop wounds from bleeding; stem leaf rubbed on insect bites to prevent swelling & pain; juice consumed to reduce fever. Only uncooked flesh of corm was used in medicines. Raw scrapings from kalo corms were mixed with the juices of kō (sugarcane, Saccharum officinarum) and other plants, the mixture then pounded, and the juices squeezed out for ingestion (Abbott 1992:101). Non Medicinal Uses: Single most important food plant to Polynesians, early Hawaiians grew 300 varieties, mainly grown for poi production. Poi is produced by steaming (in an underground oven or imu), then mashing and adding water. Also used in religious rituals, as medicine, as bait for 'opelu fishing, for gluing kapa pieces together, & as a red dye for kapa (Handy et al. 1972:111–117). `Ōlelo Noeau: [I] ‘Ai no i kalo mo‘a. One can eat cooked taro. The work is done; one can sit at ease and enjoy himself. [II] E ‘ai ana ‘oe o ka poi paua o Keaiwa. Now you are eating the poi made from the paua taro of Keaiwa. A boast from the district of Ka‘u: "Now you are seeing the very best that we have." Also used to say, "Now you will find out how fine a girl (or boy) can be in making love." The paua was the best taro in Ka‘u and the only variety that grew on the plains. [III] E ‘ao lu‘au a kualima. Offer young taro leaves to the gods five times. Advice to one who has erred and wishes to rectify his mistake. Young taro leaves often were substituted for pigs when making an offering to the gods. 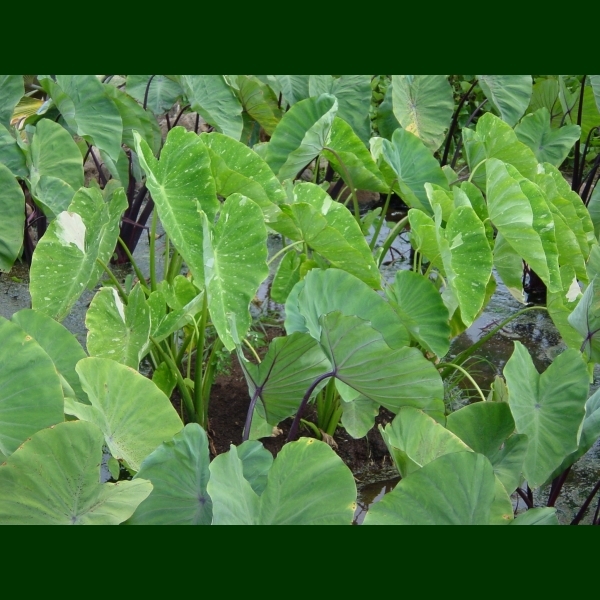 To remove sickness of mind or body, one made five separate offerings of young taro leaves. [IV] E kanu i ka huli ‘oi ha‘ule ka ua. Plant the taro stalks while there is rain. Do your work when opportunity affords. [V] E lawe i ke o, he hinana ka i‘a kuhi lima. Take vegetable food; the hinana is a fish that can be caught in the hand. A suggestion to take taro, poi, potato, or breadfruit along on the journey and not to worry about meats, which can be found along the way. First uttered by Pele in a chant about the winds of Kaua‘i. [VI] E! Loa‘a aku la ke kalo, o ka ‘apowale. Say! You'll obtain a taro, the ‘apowale. You're wasting your time. A play on ‘apo-wale (grasp-at-nothing), a variety of taro.